I love this chair. It took me a max of 15 minutes to install and it is so sturdy. The legs are metal and made to look the wood. The wheat color is beautiful and the fabric looks durable. 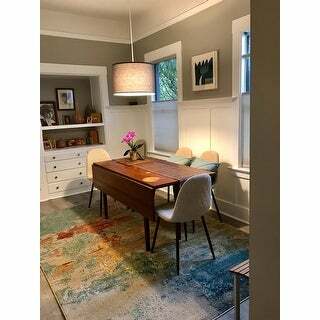 It also fits under my small henry drop leaf table with hairpin legs (also bought from overstock). Very happy with my purchase. 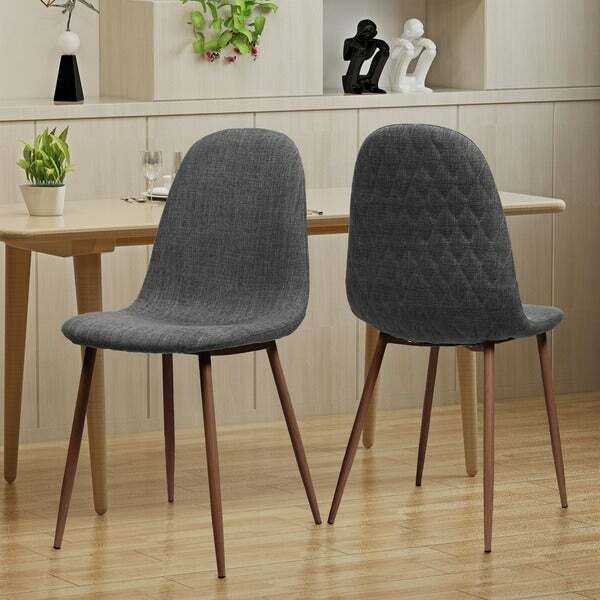 Offer a graceful nod to mid-century modern ingenuity to your home with these chic and lovely chairs. 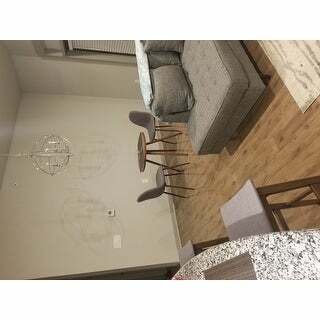 High quality materials and attention to detail give these chairs special flair that is sure to elevate decor. The legs of the chairs are made from iron with a wood finish, giving you the aesthetic look of wood with the durability of metal. Good looking chairs, but really hard to screw in the legs. I read the directions carefully but it was hard to align the holes. I am sitting in them now for the first time and they are firm but comfy. The legs are metal that looks just like wood, but not actual wood. Good value. I love these chairs! I purchased grey and they look exactly as pictured and easy to install, all you have to do is screw on the legs, which took me about five minutes. They are also really comfortable to sit on and go perfect with my new IKEA table. Love these chairs! Very easy to assemble and comfortable to sit in. Amazing chairs. It was really easy to assemble them. Fast and safe shipping via Fedex was another plus! One minor discomfort: The shipping box and protection wraps smelled brand new plastic and bond odor little bit. Make sure you ventilate well for a couple of hours while/after assembling ;) So comfortable! I purchased 4 green chairs and Overall I believe they good chairs. The color actually matched the picture color on the website pictures! The chairs are Definately firm/strong support but not as comfy as they look. They are lacking in the amount of cushion. But what I was most disappointed with was the legs are metal with a faux wood painted finish...good for weight but I purchased this chair to restrain the legs darker to match my other mid-century dining furniture! These chairs were very easy to put together, and look just like the pictures. I love how light they are, how strong they are with metal legs. They replaced some straight backed chairs and fit in nicely with my mid century style. Great buy! These chairs are great. I bought them in the lighter color and I paired them with a glass top table. I use it my office meeting room. They are super comfortable to sit in and the legs are made of metal, but look like wood. They came in a pair which was great. Two of the chairs were difficult to put together since the screw holes on the base didn't match up to the bottom of the chair. Overstock immediately swapped them out for me. Their customer service is superb! 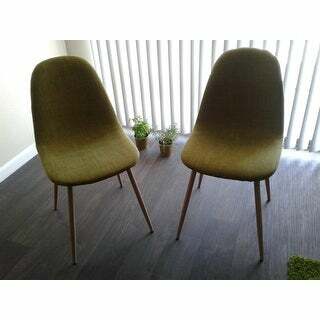 These mid century chairs were not only promptly delivered in sufficiently protective packaging, the legs were super easy to attatch, I love the way they look, and they are surprisingly comfortable and sturdy! I adore these chairs. They’re the perfect height and are so super comfortable. The color is a medium grey. They were easy to put together and are very sturdy. I’m really happy with this purchase. Easy to put together, sturdy chairs. They look exactly as pictured. Although they are called "red", they are more of a cranberry/wine color. Comfy and guests compliment them regularly. Great price, too! Great chairs for the price. Nice extra detail and texture with the quilting on the backs. Comfy to sit in. I love the color, the size, and the comfort of these chairs. They were exactly as advertised and just what I wanted. 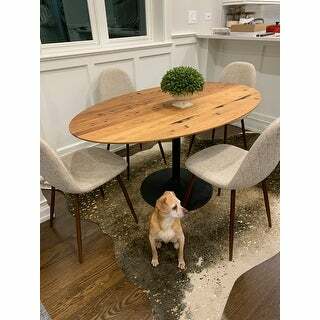 In fact, I just ordered a new table to better match these chairs. Nice dining chair! Another great offering from Overstock.com! Arrived quickly and without any damage. Photos on O.co represent the item very accurately. Overall, very satisfied with my purchase! Thanks, O.co! I love these chairs. They were very easy to put together, are comfortable, and look nice. I am impressed with the quality for the price. I plan on buying another set in the near future! Not only are these affordable, they are sturdy, comfortable and so easy to put together :) I got the blue which are a very nice pop of color mixing up the "50 shades of grey" in my apartment. I just love love love these chairs!!.. Very easy to assemble and they look fabulous in my livingroom..thank you Overstock!! I love the texture design on the back of the chairs. They were easy to assemble and they are very comfortable. However the screws loosen up easily, so keep the Allen key close by to tighten them back up. "How much does each chair weigh?" This weighs approximately 16 lbs. "When will the other colors be back in stock? Thanks"
"Will the dark grey color with the dark legs come back in stock?" "Is there any chance of finding the blue color before July?" These should be back around August 2018. "Will the colors be restocked? If so, about how long before the blue is back in stock?" This should be back in stock by July. "What is the weight the limit on the chairs?"